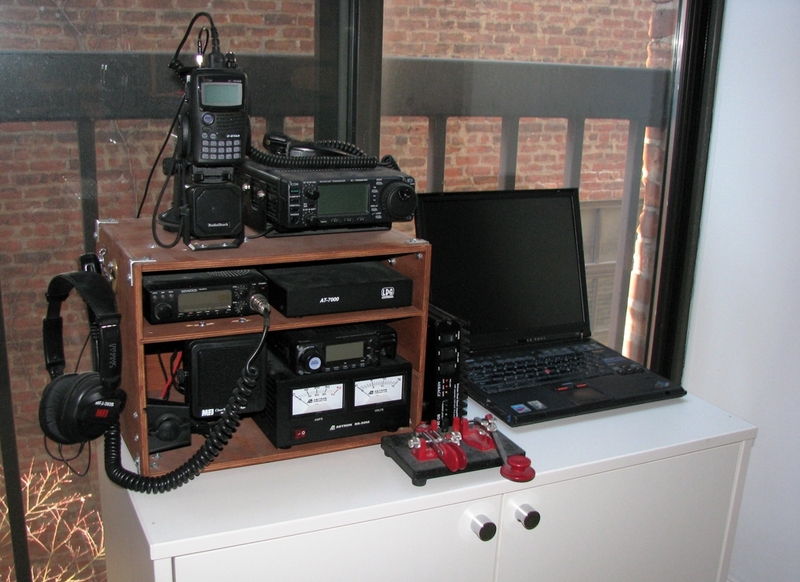 Some creative solutions for getting on the air from a New York City apartment. Having been a ham since I was 10 years old and still loving the hobby, when I built my latest home in Sag Harbor, New York, I included a “purpose built” shack. Being right on a salt water bay, grounding antennas was a snap and while I was within the village limits, they had never worried about antenna restrictions. I can sit at my full size ICOM HF transceiver and look out at the water — but more about that later. The problem is that I spend only weekends at that home and not all of them at that. I work in New York City, where I have a one bedroom apartment. Although it is 843 square feet, huge by New York City standards, wanting a full size kitchen and a full size bedroom and 2 bathrooms left little room for an office or a radio room. To complicate things, I happened to fall in love with a converted church built in 1839 that was not only in a landmark area of Greenwich Village, but was also a landmark building. So now both antennas and radio space was a problem, compounded by the fact that I love to entertain and an unsightly array of ham radio equipment and cables was not going to cut it. I love 220 MHz, my main local and mobile band, but I also like D-STAR on 144, 440 and 1200 MHz, as well as 2 meter SSB and CW, and just about anything on the HF bands, especially RTTY and CW. Thinking back to my old separate receiver/transmitters and Model 15 teletype made me very thankful for the new compact equipment and I quickly had a solution in mind. Thanks to Mark, WB9QZB, a UPS man delivered an ICOM IC-706MKIIG to my address and I had 160-6 meters plus analog 2 meters and 70 cm covered. A plug-and-play interface, from Green Mountain Radio and sound card software would solve the issue of RTTY, computer radio control, packet, etc, when coupled to a spare laptop I could put into service. With the laptop connected to my wireless network, printing RTTY would be easy to handle. With the keyer and DSP built into the IC-706 there was a lot in a very small package, freeing me from additional boxes and cables. The 220 MHz band was easy as I had a spare Alinco DR-235 floating around and the control software for it. Two ICOM radios cover the bill for D-STAR and the handheld transceiver is coupled with the dual-band Mirage amplifier boasting its 5 W to 80 W while switching fast enough for the digital headers. An LDG coaxial tuner for the IC-706, a Rigrunner power panel and some antenna switches completed the equipment list. The purchase of my first switching power supply completed the power requirements, while staying small and easy to move around. A trip to Gene’s, K2KJI, local ham store, where I purchased all my ham needs, resulted in securing a set of iambic paddles, headphones, cables, connectors and advice on what to do about antennas, as well as everything else listed above. Now I had all the components, but how to hide them while making them easily usable. A trip to IKEA resulted in the purchase of a small cabinet that fit in front of a combination side window and sliding door in the apartment. For $37 it worked perfectly. 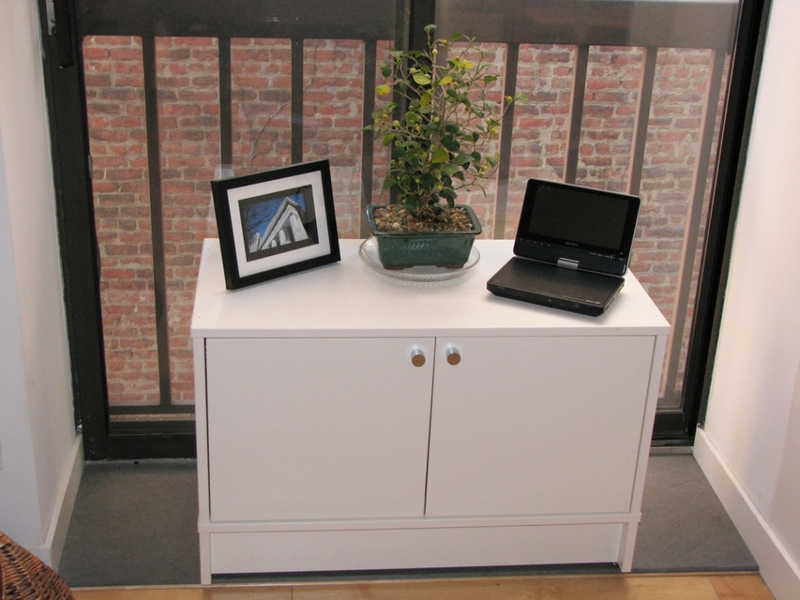 All the equipment fits inside, while the top could be used for display of pictures, flowers, etc, when company is around. With drill, bits and some hand tools, all the radios and accessories were installed in the box and surprisingly the box was light enough to lift onto the top of the cabinet. 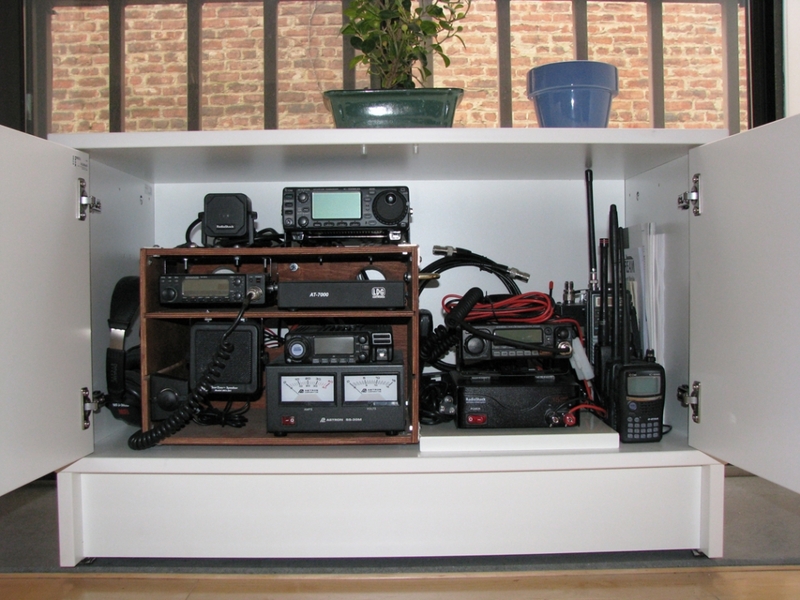 When not in use, the box could be slipped inside the cabinet to join my antenna analyzer, SWR bridges, spare tuner, some handheld transceivers and batteries. My spare laptop sits in the closet and is out of the way but ready to put in service when I want to operate. So now, what to do about antennas. Thankfully I am on the board of our coop and have access to the roof. Being on great terms with our building superintendent was helpful too. 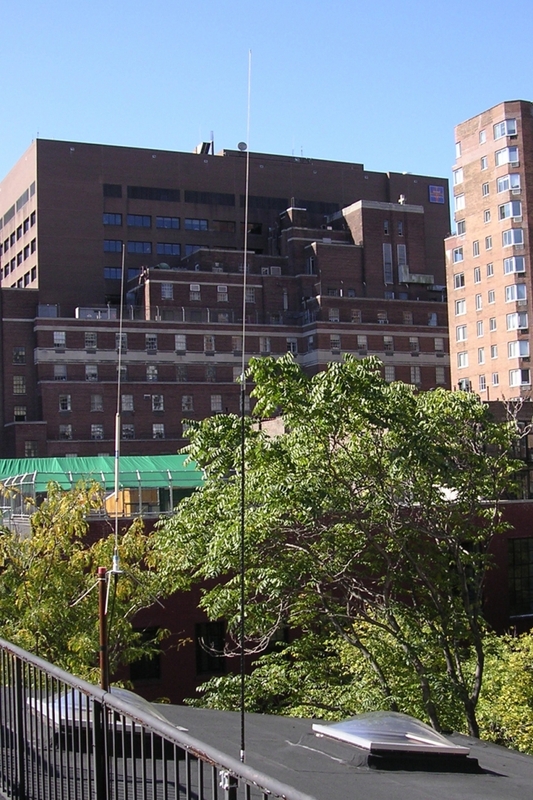 Running around a section of the roof is a steel fence providing a mounting solution and over 200 feet of metal to use as a counterpoise. Then, as luck would have it, our super told me that the cable company was coming to redress all the cable TV lines for the 15 apartments in the building along with installation of new grounds. A quick trip to see Gene and I was in business. Armed with plenty of coax and connectors, I laid out three lines to the roof. Between the super and the cable guys, the lines got run over the roof, down the side of the building and into my apartment. From the street they are hard to see and to the casual passerby look just like a few more cable TV lines. On the other end of those cables sit my three compromise antennas. There is a multiband Maldol mobile antenna, made for the IC-706, which gives me coverage on 6 and 2 meters and 70 cm, and with the LDG tuner, full band coverage on 10, 15 and 20 meters. With one of the antenna switches, it can also be used for one of the D-STAR radios on 2 meters and 70 cm. Line two, also coming from an antenna switch and the antenna side of the LDG tuner goes to a mount holding a Ham Stick. 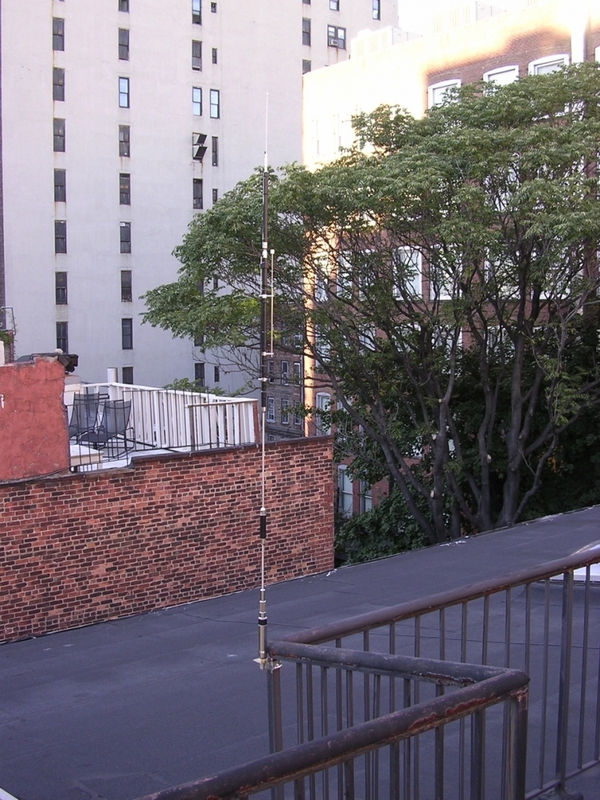 This antenna, along with its replacement elements, allows operation on 12, 17, 30, 40, 60, 75 and 80 meters, though I have to walk up onto the roof to switch them over. The last line goes direct from the Alinco to a Hustler 220 collinear mounted on their ground plane kit. Since none of the antennas is visible from ground level on the street, no landmark regulations are being violated and though they are not impressive antennas, I am on the air on all but 160 meters. So what is next? I think a G7-220 will replace the 220 collinear and the Maldol will give way to an 8 band ground-independent full-size vertical that I will mount on top of the elevator tower. For 75 and 80 meters I will still have to use the Ham Sticks. I will need to figure out a new setup for 2 meters and 70 cm along with something more substansial for 1.2 GHz than the mag-mount on the air conditioning unit, but this should all be doable. Who knows, maybe even a wire antenna that will tune on 160. Of course, the new ICOM IC-9100 and an Alinco or transverter for 220 would eliminate much of my setup. I think I will wait for a hoped for IC-9100 Pro, with a color display and other niceties included in the 7000 series radios. Now that I have this under control, I guess I should look to putting up some antennas out there in Sag Harbor. The house is now 8 years old and all I have out there is some wire and a SGS commercial grade tuner, along with some VHF and UHF verticals sitting in the garage. I guess space is not always the answer. Hope this is helpful to other hams living in cities like New York. Photos by Bob Kittine, WA2YDV. Bob Kittine, WA2YDV, was first licensed at age 10 as WN2YDV and now holds a General class license. He has traveled around the US operating from New York, Illinois, Louisiana and Tennessee. Bob’s favorite band is 220 MHz but he is active on HF, VHF and UHF using CW, SSB, FM, RTTY and packet and has even operated two repeaters in his time. Bob can be reached at 145 W 13th St, Apt 203, New York, NY 10011-7859.